Vaastu Purusha Mandala is embodied energy. Vaastu Purusha Mandala (VPM) is a “Theater Stage”. It is like the retina of the eye. It is where things happen. Technically, it is a material energy grid (9 x 9 Paramasayka Grid and subtle energy grid 8 x 8 Manduka (frog) Grid) with inherent qualities or an “inherent order in the structure” of the grid. VPM is the layout of the building, or its blue print. 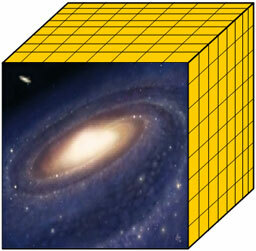 “The tri-dimensional cube is the KARU (egg) and this gets magnified into the universe. This is taken as the basic form or basic pattern of the house. This is called Garbhagriha or Bindu griha.” The cube is the most peaceful form; therefore, it is a recommended shape to be used in the house. It can be rectangular too, but with the specific proportions. If a designer used any polygon or circle as the pattern of a living space then it is too dynamic for the inhabitants of the house and people have no rest in such a space. Built space gets filled with energy, and energy’s rhythmic vibration slows down its movement from the center toward the mother walls in a specific order. The energetic Space is the “primal creative element” and the source of Panchabhutas, or the Five Qualities of Built Space. VMP has its own concentric energy belts. The center part of the grid is Brahmasthan or Brahma Pada. Brahma Pada is the nuclear energy field of the Mandala where the frequency of vibration is the highest. Therefore, it is only good for special functions, gatherings, celebrations and spiritual activities. The next concentric belt is Deivika Pada. The next concentric belt is Maanusha Pada. The next concentric belt is Paisachika Pada. It is the most suitable place to live. It is the slowest energy rhythmic vibration and is closer to the quality of matter.